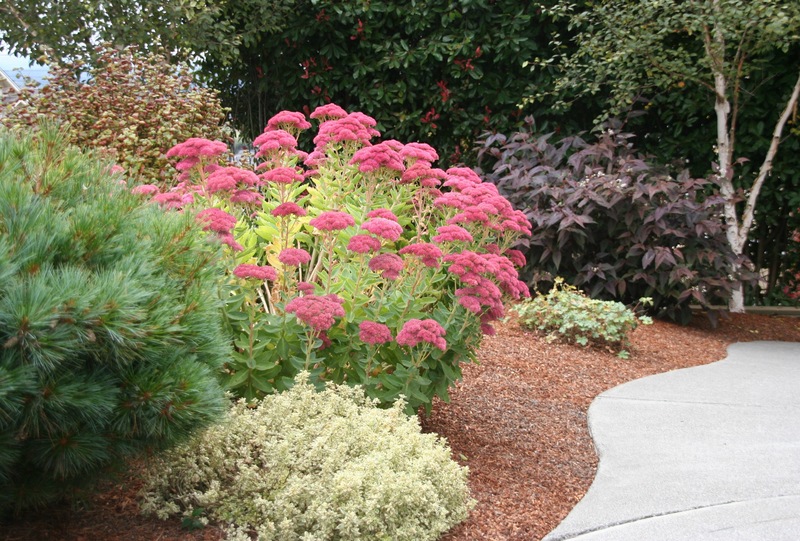 Sedum ‘Autumn Joy’ is a true garden classic, especially paired with ornamental grasses, lavenders and colorful sages. It’s particularly great because during the summer when everything else is blooming, its greenish-white buds are getting bigger and bigger, creating a subtly beautiful show, then as everything else slows for the fall, ‘Autumn Joy’ bursts into bloom with a cheerful pink color that looks great with the fall colors on the other plants. 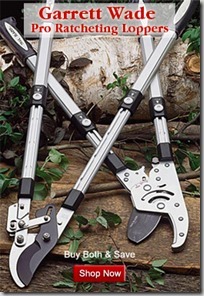 In this video, I’ll show you how to prune it, using my favorite Fiskars Powergear Hedging Shears (video review here). If you possibly can, wait until late January or so to prune to allow the birds to enjoy eating all the seeds it provides through the winter. I pruned this one early since it’s by the front door, but I’m setting the seedheads on my compost pile to encourage the birdies to scratch around. If your Sedum was floppy this year, it’s a good sign it is either getting too much shade, or that it needs to be divided. To divide, dig it up, use a sharp shovel or hori-hori to cut the rootball into thirds or quarters, and replant one portion. Then you can make friends with neighbors by giving them your extra plants. Filed Under: How to Prune Tagged With: Fall, Pruning, Tools, Videos, What to Plant? Thanks! I planted about 25 of these on our property this past year, they are one of my favorites! Any particular grasses you like them with? Ours are planted with various salvias and euphorbias now- still adding plants though! Those are some pretty spectacular plantings of ‘Autumn Joy’. I’d never thought of them as winter birdfood before, what a good idea. Thanks also for the pruning tips: I can see why you like those heavy-duty hedge shears for the job, very time-saving if you have a lot. .-= Pomona Belvedere´s last blog ..Winter Carrots (Daucus carota) =-. Hi…I enjoyed your video…easy going, not in a hurry…good job! Very good and useful information and you are adorable! Great presentation. Everyone in favor of Gen writing a fabulous book about being a fabulous and beautiful gardening goddess raise your left pinky!!! .-= Iona´s last blog ..The Invention of the Jewish People =-. 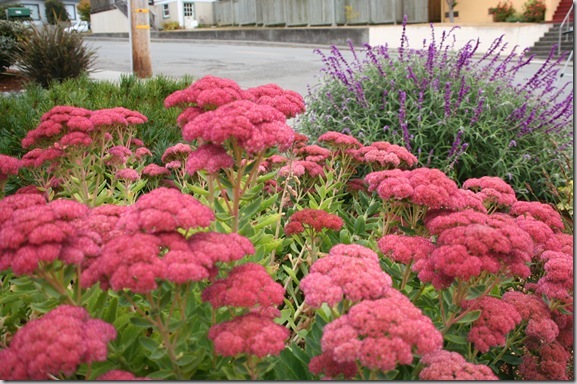 I was very impressed with your pruning video of the ‘Autumn Joy’ Sedum. The instructions were clear and the tidbits of feeding the birds were great. I have never let my seed heads stand as you suggest. Next year I will though. Hi Carri! I think your idea of putting Autumn Joy with Euphorbs and Sages is perfect. I like Autumn Joy with just about any grass – Miscanthus (if they are not invasive in your area) is really great because they bloom around the same time and have that bronzey pinky tone to their flowers that go so nicely with the Sedum flowers. 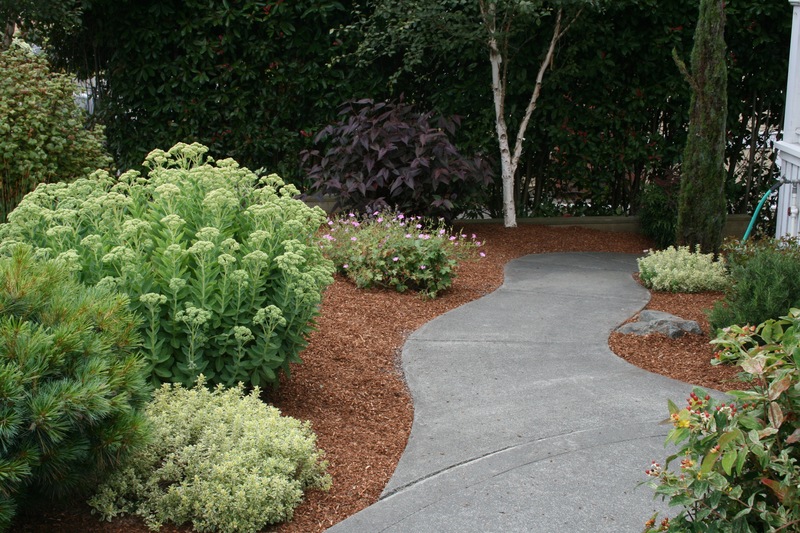 I also like this Sedum with the variegated Oregano in the photos because of the way the Oregano goes with the green buds in summer. Pomona, yes the hedging shears work like a dream. I’m considering picking up some hedgers by my beloved Bahco brand, but the Fiskars just work so well I hesitate to pay $40 for something I don’t can be improved upon!! Jeannie, thanks so much for your kind words! Iona, I am blushing. If I did that I’d have to have a cameo from my fabulous, no-nonsense friend Iona!! NH Nursery, welcome!! Looks like you’re selling Sedum plants – cool! Thanks for stopping by and thanks also for saving your seeds for the birds next year! You’ll be most popular among the feathered contingent. Such a great video – as usual!! These are some of my favorite plants, and I use them in almost ALL of my gardens, but am always disappointed that I never seen birds eating their seeds! I am a huge bird lover, and wonder what birds tend to love these since they’re obviously not in my area!! (I’m in the Bay Area, CA)….any thoughts? .-= rebecca sweet´s last blog ..Hey – we get Fall color, too!!! =-. I love the seed heads and leave them over winter, but in spring the basal leaves (or baby cabbages!) are already there so Icut each individual stalk so as not to disturb them. This *is* a pain, agreed! In other news, oh boy, oh boy, oh boy, the package from OpenSky came! I was confused at first because the return address was Wetsel in VA… I love the soil knife which I’m eager to try in spring–it’s not that the ground is frozen solid yet, but I have nothing specific to dig in or out right now. And the gloves are awesome–the pink ones are for my mom, the blue for a friend, and the green for me! Yay!! Thanks again for offering the free deals. By the way, do you have cats? HA! As luck would have it, during my final *final* outdoor cleanup for the season, I found an orange guara still in its pot–the soil/roots were frozen, but the leaves looked A-OK, so I took the trusty Fiskars soil knife and dug a hole for it–it was easy work! It was also great to cut the rootball (roots were all tangled) and to make a narrow slit after planting into which to place the plant tag. I love that knife!!!! I can see I’m going to use it a *lot* next season. Yay! By the way, can you garden all winter in CA? If not, what do you do over the winter, job-wise? .-= Monica the Garden Faerie´s last blog ..Gratitude =-. Rebecca, I sure wish I knew what kind of birds eat them – I’ve seen little brown guys with subtle markings eating them before, as well as the little plump ones with gray heads and a black stripe across their head. I clearly need to take a Bird ID class! The brown ones were scratching the soil for the seeds and the gray-headed dudes clung to the heads and ate directly. Monica, yay!! 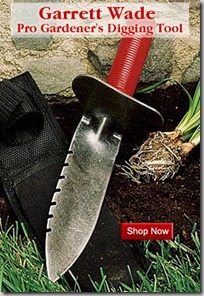 So glad you’re enjoying your new Soil Knife! That’s a great tip about plunging them in to make a vertical slit for a plant tag. Cool! We do garden all year long here. Pruning season happens in January/ Feb, then March is slow, then in April the weeds start and everything’s growing! It gets frosty here in the mornings but it isn’t that bad. I usually try to use the slight slowness as an excuse to market hard and pick up new clients, then try to hire a new employee in spring when everything booms. thank you so much for the wonderful pruning video. Autumn Joy is my favorite flower because it is beautiful, easy to care for and brings in the butterflies/bees. I just love this flower. I bought mine about 20 years ago at a fee market from a cute little girl. She told me I will love this flower and she was right. 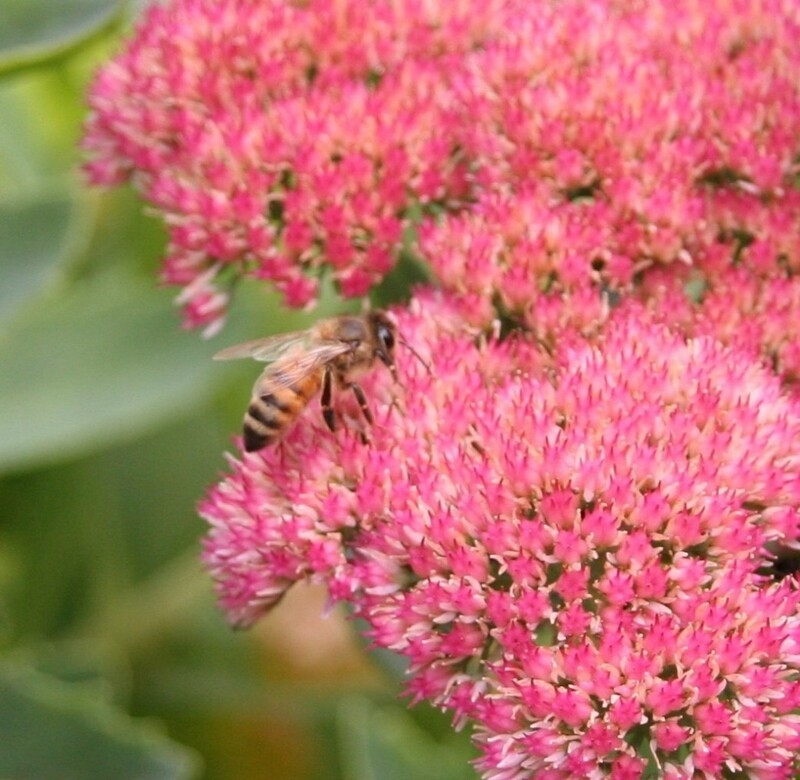 Now, I have about 50 plants (all from that one) and my garden is very busy in late summer with butterflies and bees. What an enjoyable garden Autumn Joy has given me. Question – is the purple one (my favorite) a particular variety? does it have a special name. Is it just another color for Autumn Joy? I mostly see the red variety which to me is not as beautiful as the purple. Thanks again for the video. Jeanne – I wish I knew! Do you mean purple leaves or purple flowers? Well, at this point you’d only be cutting off the flowers! No sense to that. You might try nipping them back when they’re about 10″ tall, just pinching the tips so they don’t get so leggy, but I’d generally see legginess as a sign they’re getting too much shade, not enough water or mulch (not that they need much of either, but a little bit seems to keep them sturdy), or they need to be divided. So I’d do that rather than pinch them, personally. If you do pinch them next spring, let me know how it works. Hi, what is the plant behind the Sedum in the third picture? The plant that has the long purple flowers? And is it a perennial? Hi Brad, I appreciate seeing the natural form of each plant, so I would separate them out about 2-3 feet away from each other. But I don’t think it will kill them to be so close. You can always divide them later! It just will look kind of crowded and oddly-shaped. Thanks , That’s what I’ll do, I’ll plant them about 3 feet from each other. I think you’ll be happiest with that! Within two full years they should be filled-in!